So you want to increase your sales but you don’t know where to start. We’ll start with some easy promotions and tools to get you up to speed. First of all, to display our tools on your site you must have installed one of our apps or embedded our code in your website footer. (You will be prompted to create a Zotabox account if you haven’t already completed this step). Great, now do you have any products that you would like to promote or sell more of? Wonderful, can you offer a discount of 5 or 10 % ? Let’s start with a simple percentage discount. Let’s use our simple header bar for your promotion. Choose a product or products that you would like to offer a discount. Go to your header bar setting page. Edit the main text to promote your product and discount amount. 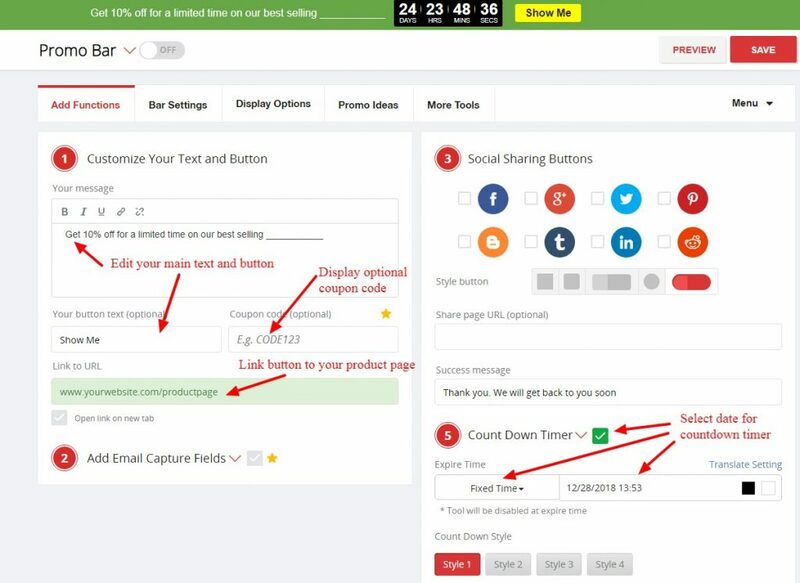 Add an optional timer to spur visitors to take action. Note: Your tool will automatically turn OFF when the timer reaches zero. 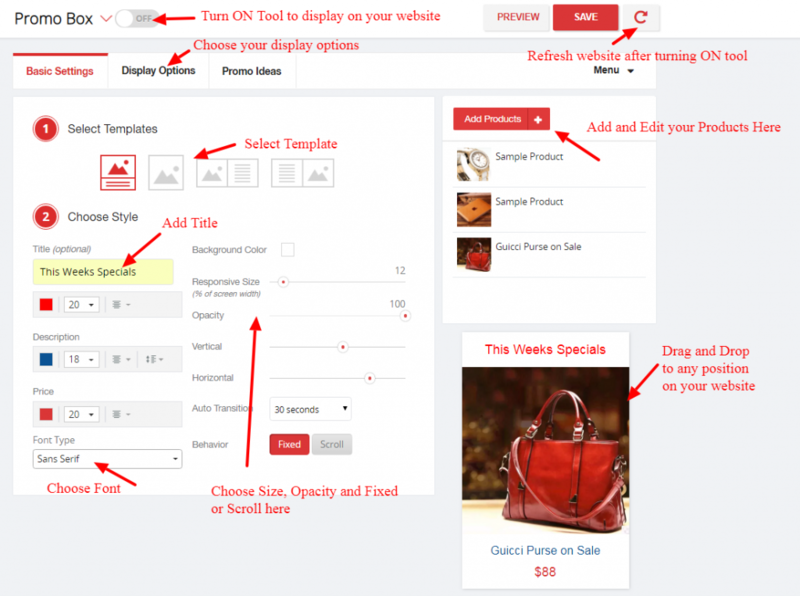 Enter the product page URL on the button link for your visitors to go to your promotion. Customize your header bar style, font, color, opacity etc to suit your needs. Adjust your display options or tool will display on ALL pages by default. 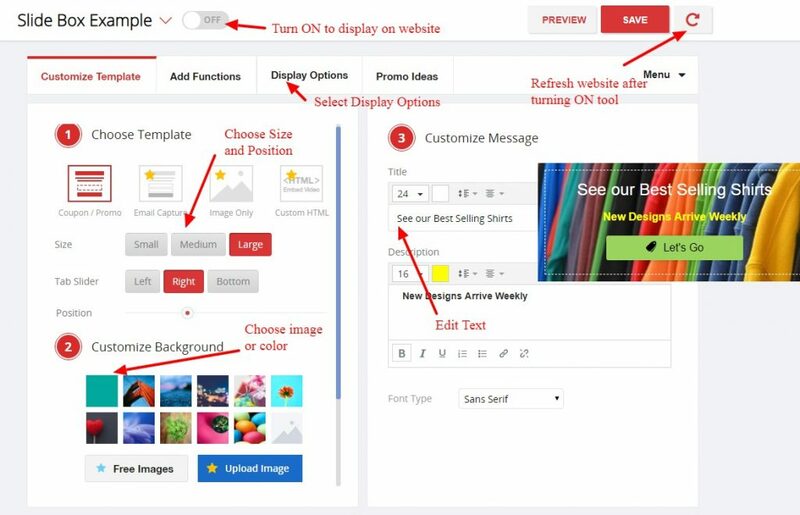 Turn ON your tool on the setting page and refresh your website. Go to your stats page on the dashboard after a few days to see the results. Experiment with different promotion ideas to see what ‘clicks’ with your visitors. One of the easiest ways to increase your sales is by promoting your best sellers. Don’t know what your best sellers are? Your customers will tell you what they like most by voting with their wallet. Let’s use our Slider Tool for this example. Decide which Best Selling Products you would like to promote. Go to your Slider Tool setting page. Choose a background image or custom image (or color) for your slider. Edit your text to advertise your best sellers. Add an optional timer to spur visitors to take action (on the ‘Add functions tab). Note: Your slider will automatically turn OFF when the timer reaches zero. Enter the product page URL on the button link for your visitors to go to your promotion (on the ‘Add functions tab). Customize your slider style, font, position, opacity etc to suit your needs. The reality is, most visitors will leave your website without buying anything. You have one last chance to ‘grab them’. Don’t waste this opportunity. 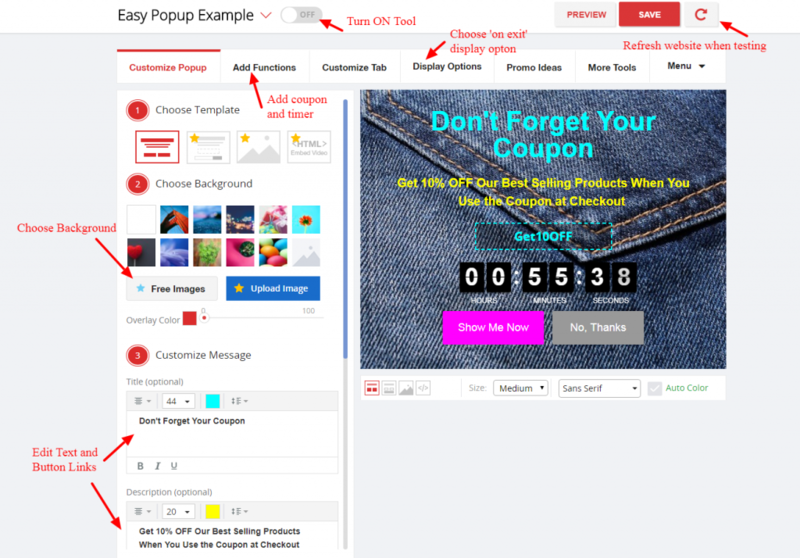 Create a coupon popup that displays when your visitors show ‘exit intent’ (moving their cursor towards the back button or outside their browser). Note: The ‘exit’ option does not work on mobile devices as there is no cursor and mobile browsers do NOT allow tools to block the visitors back button. 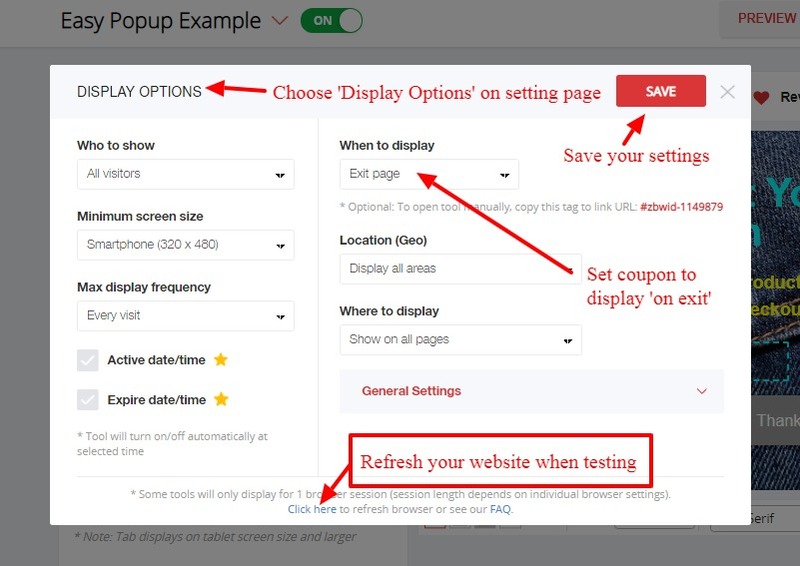 Go to your Easy Popup setting page. Choose a background image or custom image (or color) for your Popup. Edit your text to advertise your coupon. Note: Select ‘Repeat Daily or ‘Visit Time’. Enter the product page URL on the button link for your visitors to go to your promotion page (on the ‘Customize Button’ section). Refresh your website often when testing. Weekly or Monthly Specials are a great way to get regular visitors back to your site (and buying from you). Try our Promo Box to display multiple specials at the same time. New Arrivals are unique. They pique your visitors curiosity. You can use any of our tools to promote your latest arrivals but let’s use our notification box for this example. Create a page which showcases your newest arrivals. You can create a new landing page here and link to it from your website. Go to your Notification Box Tool setting page. Edit your text to advertise your new arrivals. 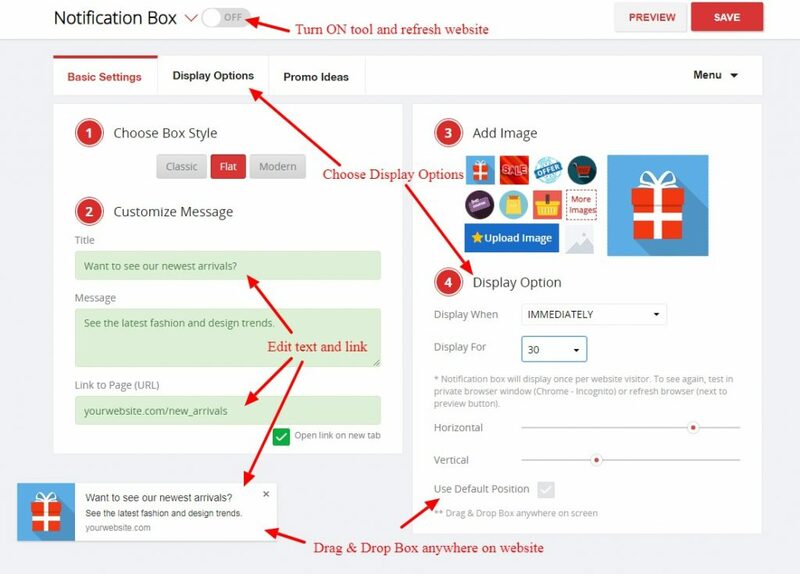 Choose or upload custom image to display on your notification box. Enter the page URL on the link for your visitors to go to your new arrivals page. Customize your style, position etc to suit your needs. See more general promotional ideas here. See examples of actual top promotions from other merchants here. Still have doubts you can create your first promotion? Send us details of the product or promotion you would like to advertise to customerservice@zotabox.com. We will create a header bar for you and set to display on your website. Send us all details such as website url, product you would like to promote, price, expiration time (if required) and link to your product page.